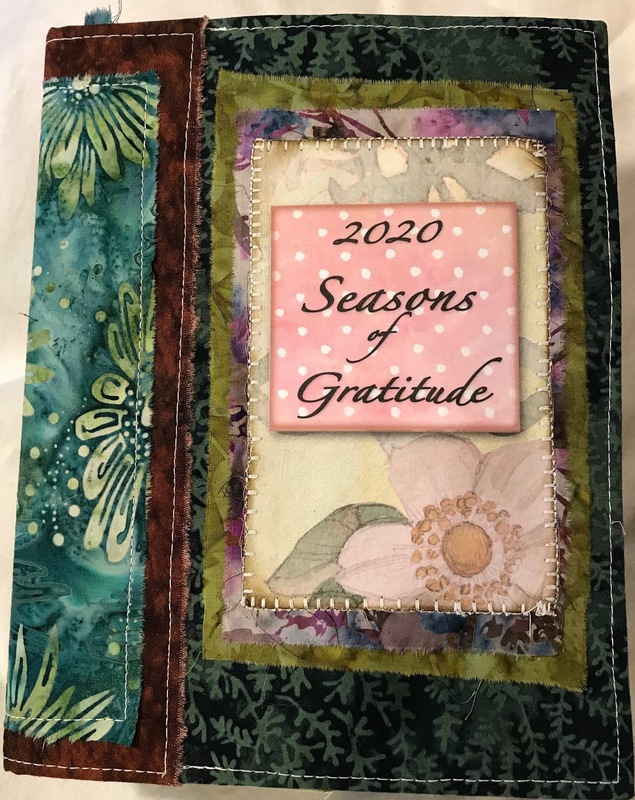 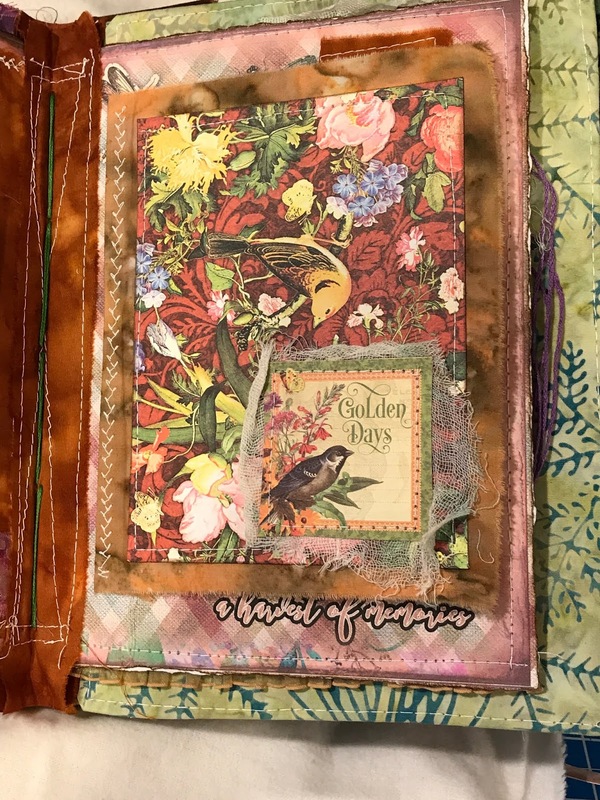 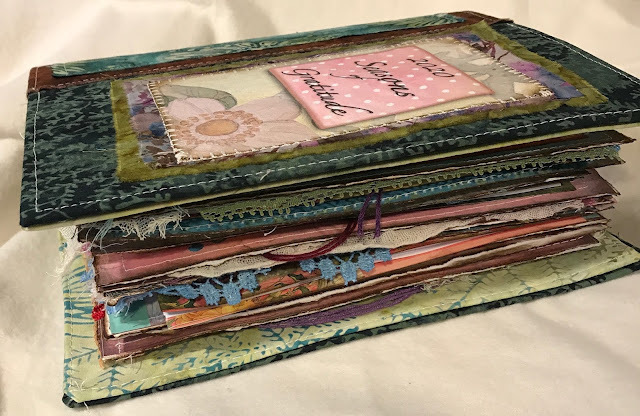 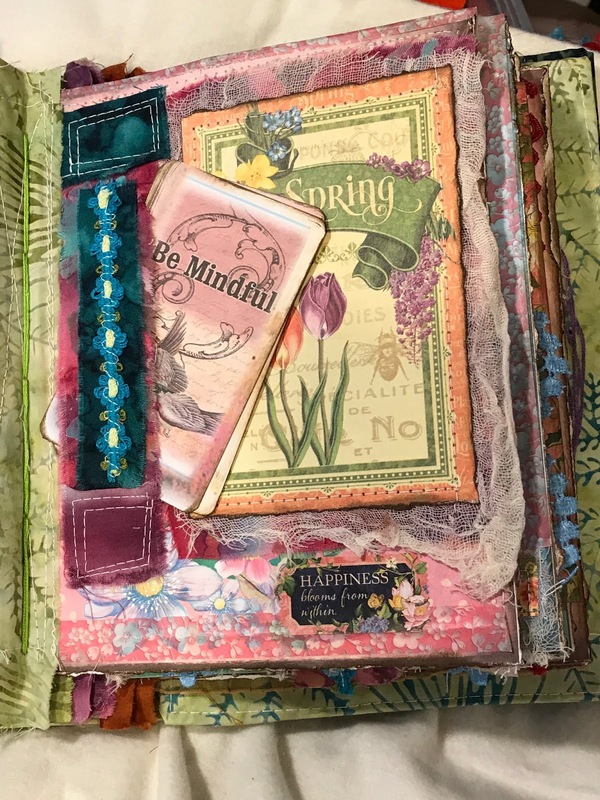 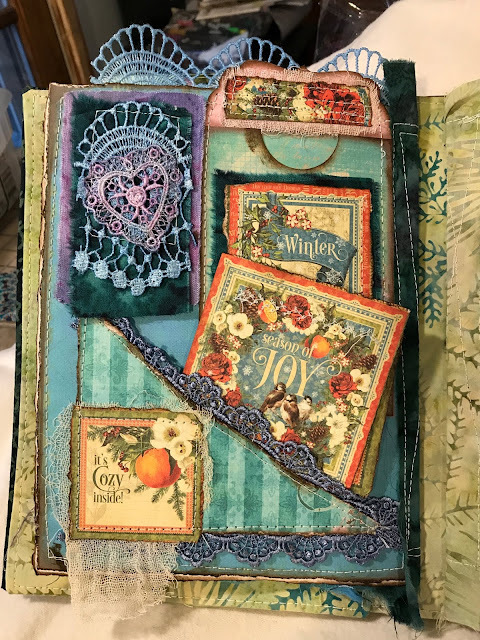 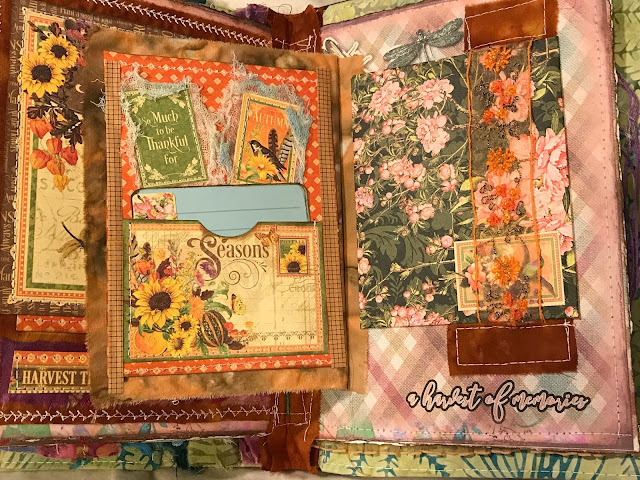 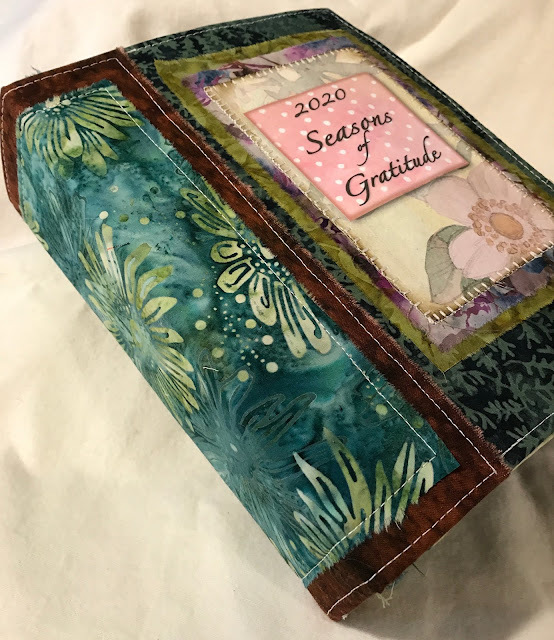 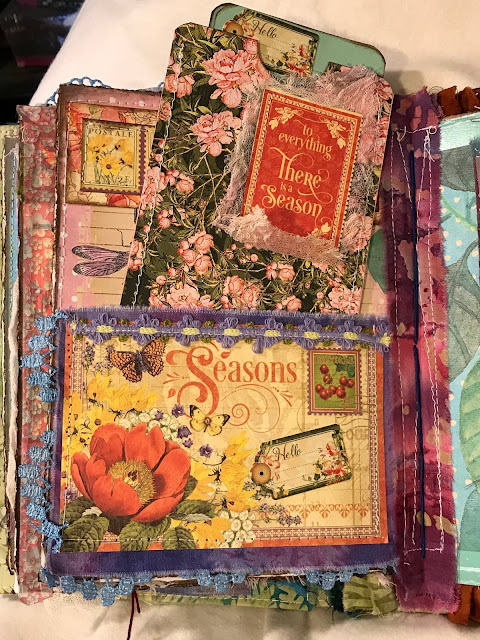 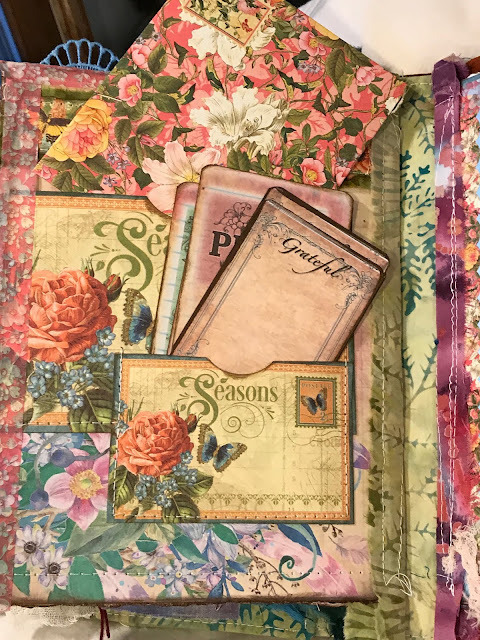 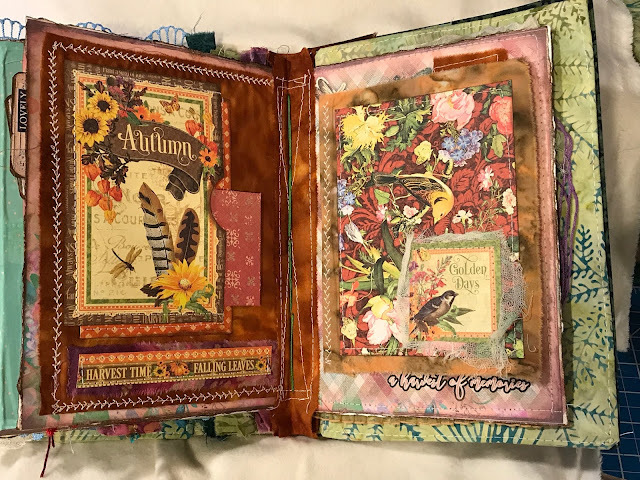 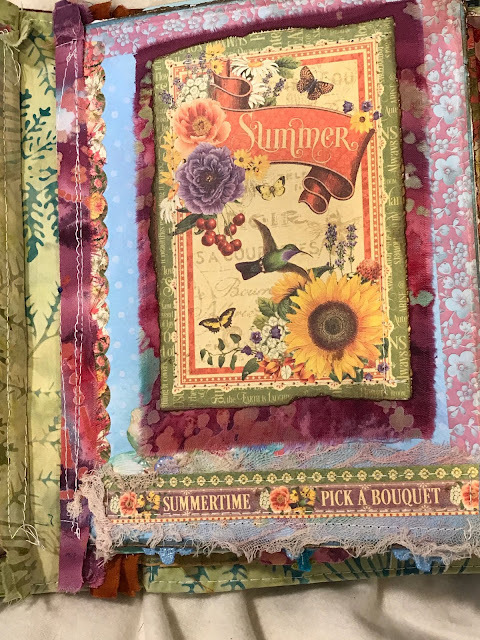 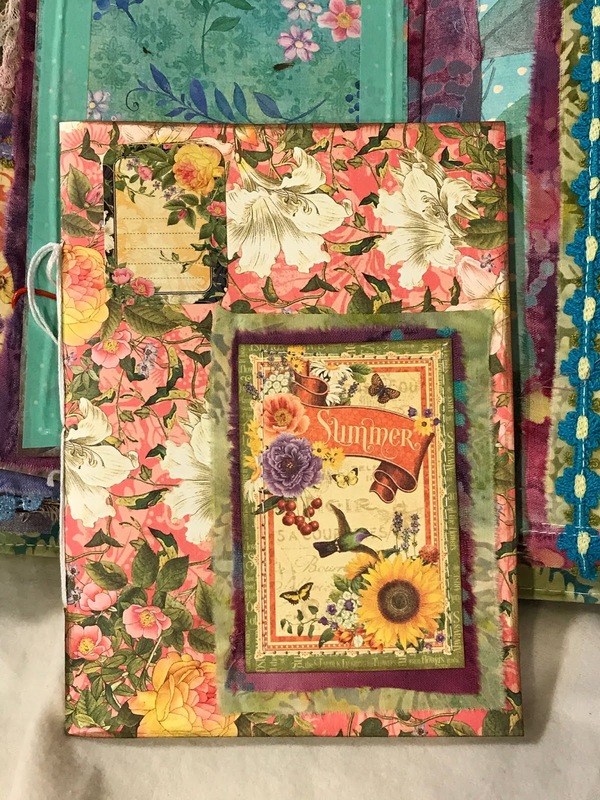 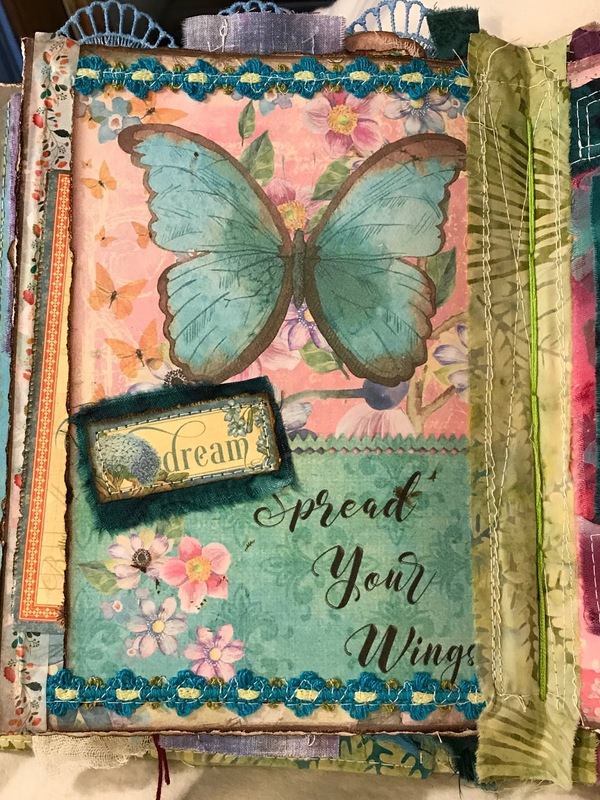 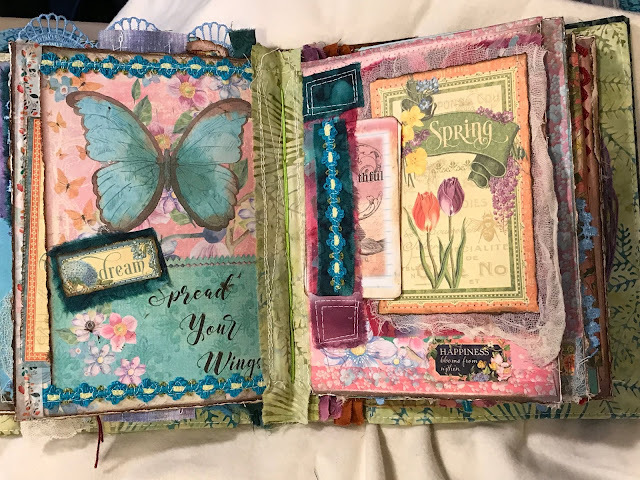 This is a blend of Batik fabrics, beautiful scrapbook papers, and images created in Photoshop. 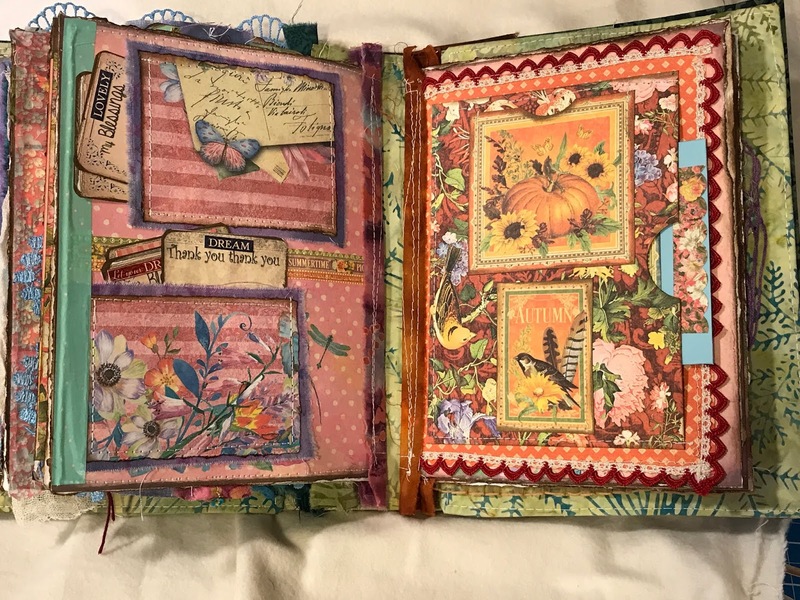 Four signatures with the stitches hidden in the spine. 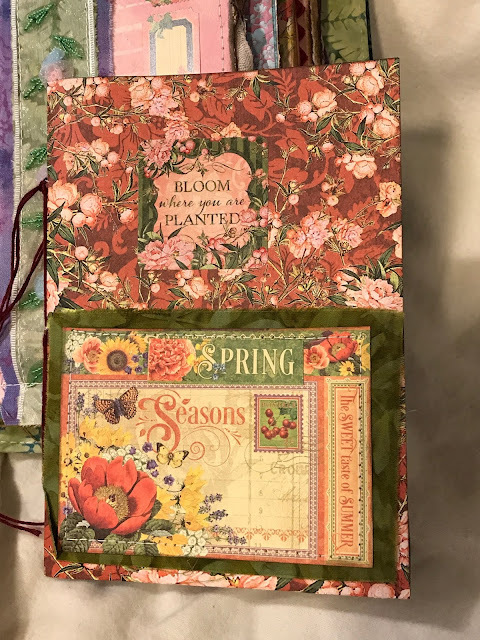 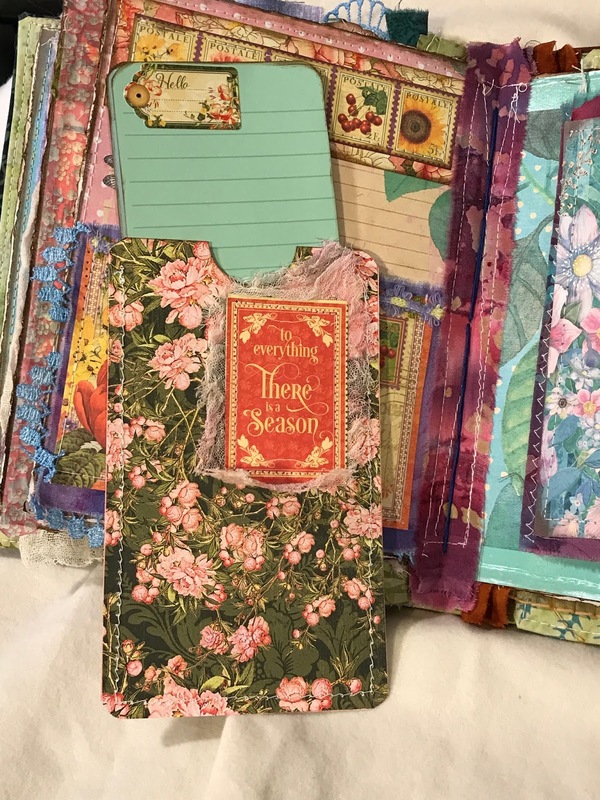 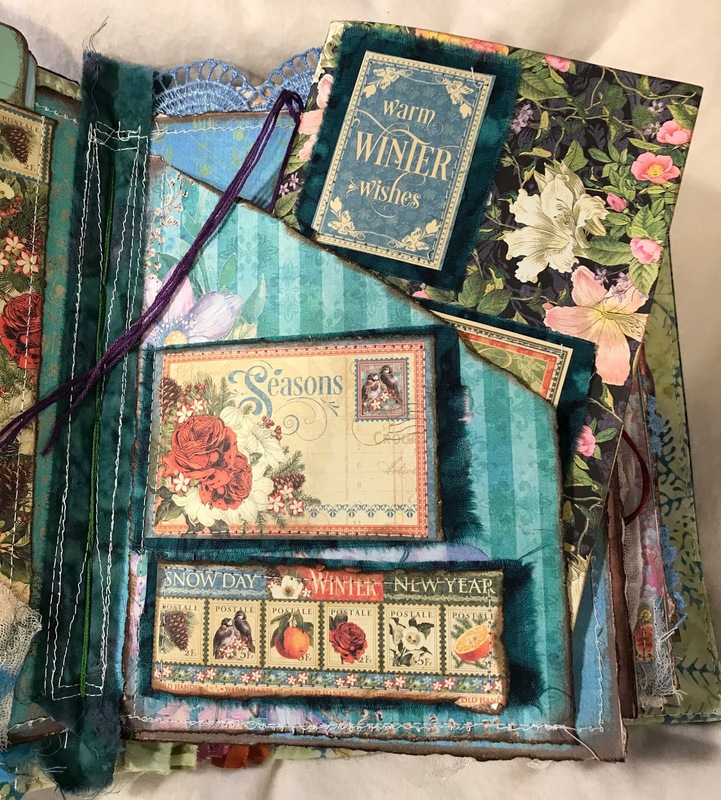 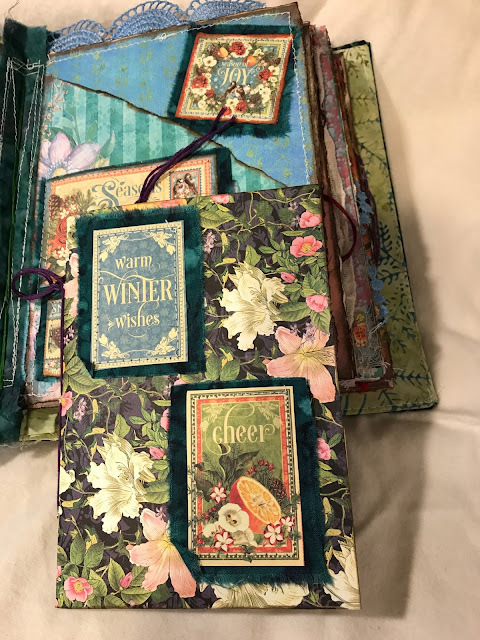 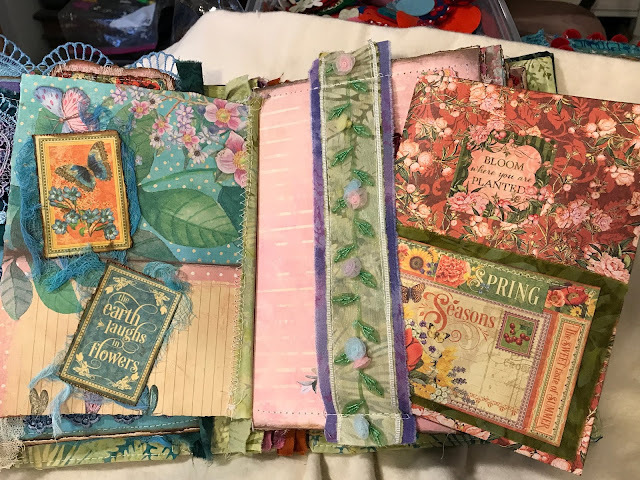 Includes FOUR individual SEASONAL journals you can take out for easy journaling. 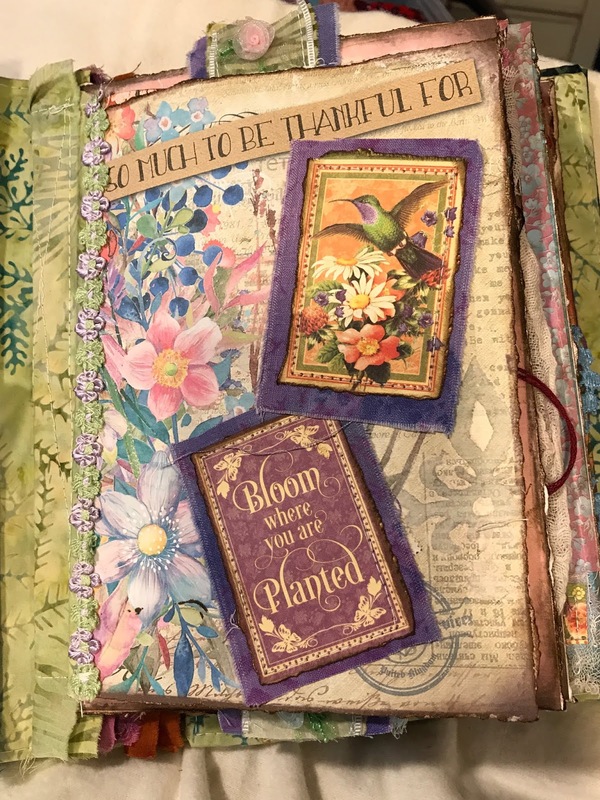 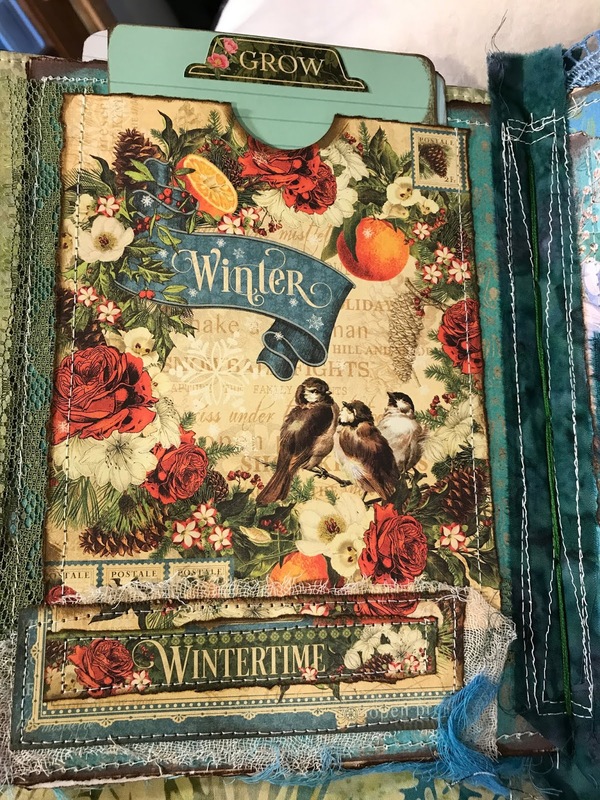 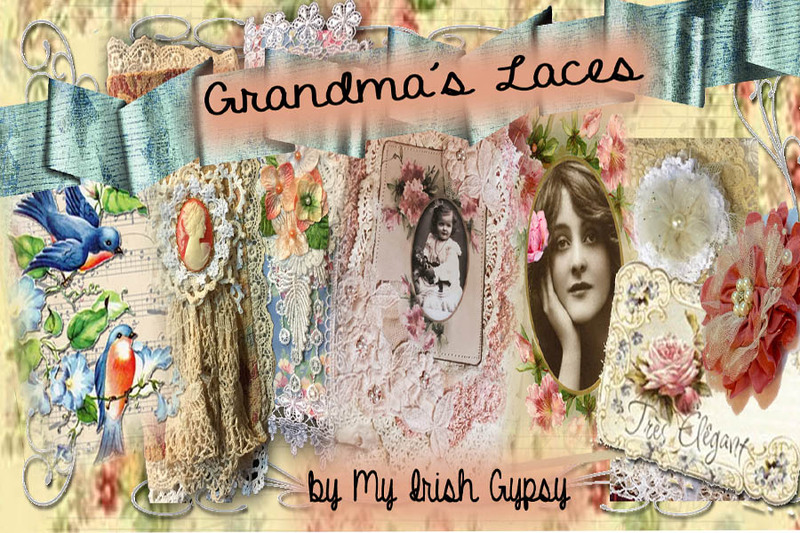 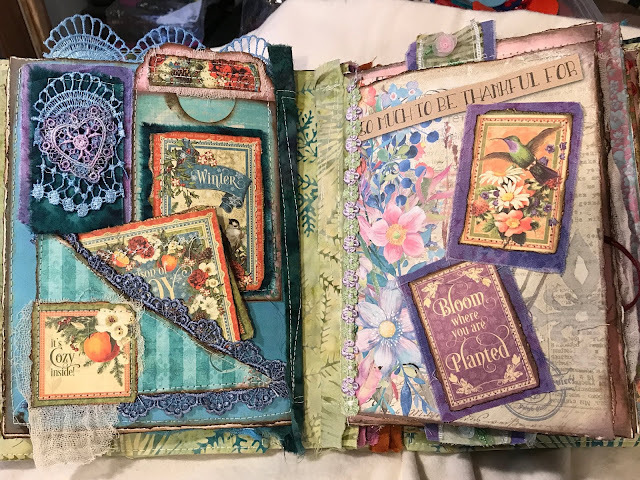 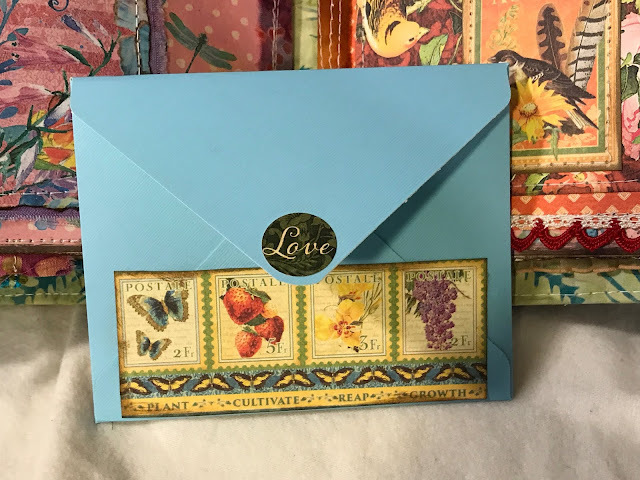 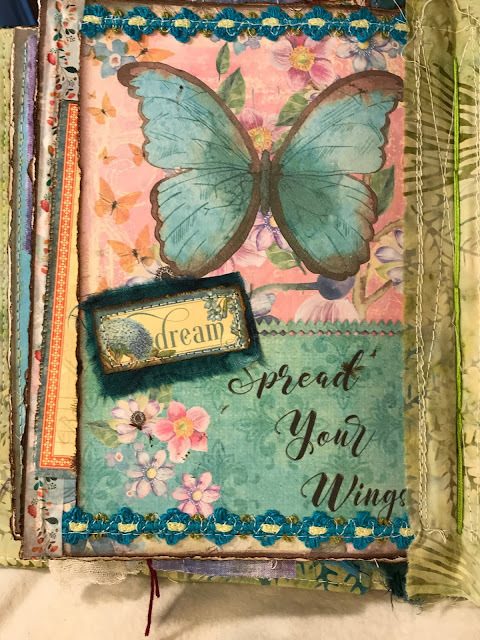 I want to acknowledge Linda Matthews for her amazing inspirations, her journaling classes, and her wonderful down-loadable graphics on Etsy. 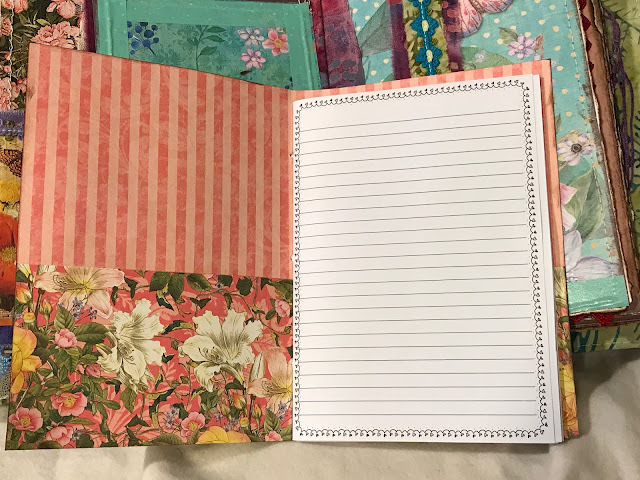 Four signatures, one spread (4 pages/pockets) for each season. 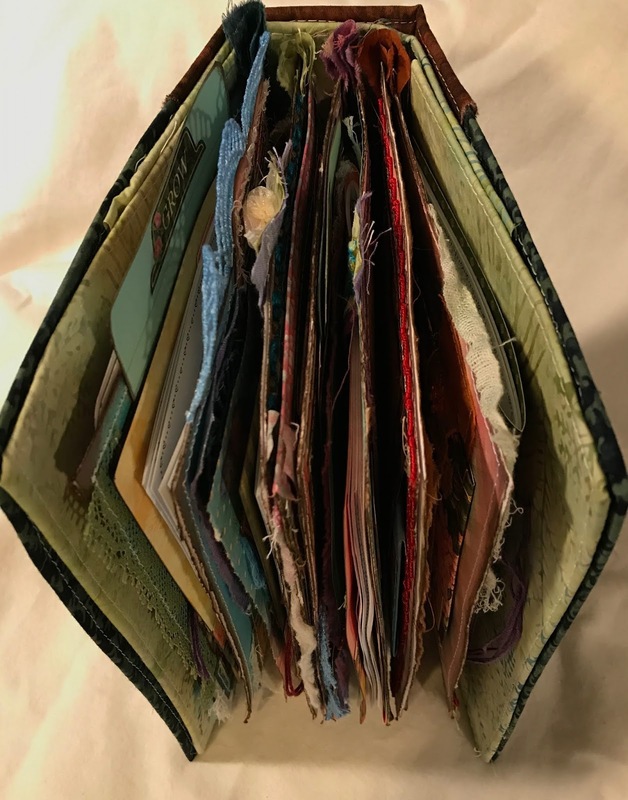 Stitches are hidden in the spine. Inside front cover. 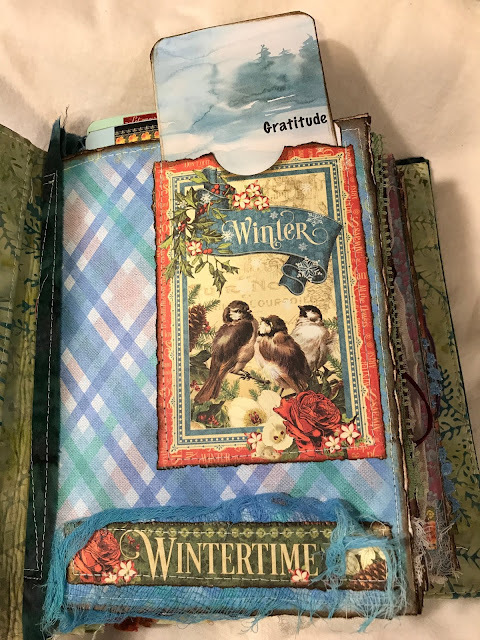 Left side has a sewn pocked with a few gratitude tags. Left side is a blend of Photoshopped paper and scrapbook papers. 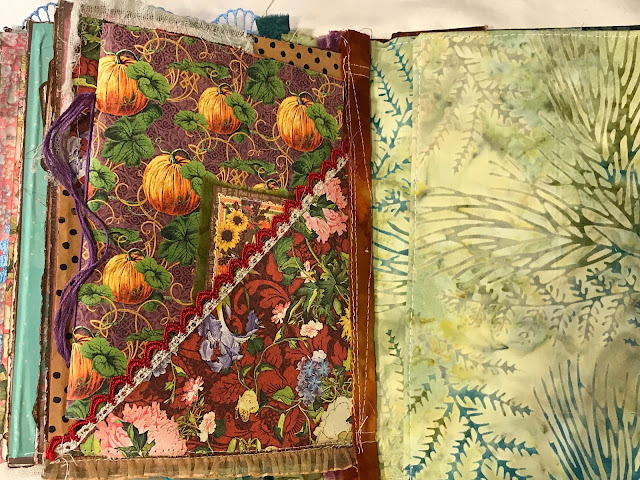 First signature center spread ...large pocket and journaling cards on the left, another pocket on the right holds the Winter journal. 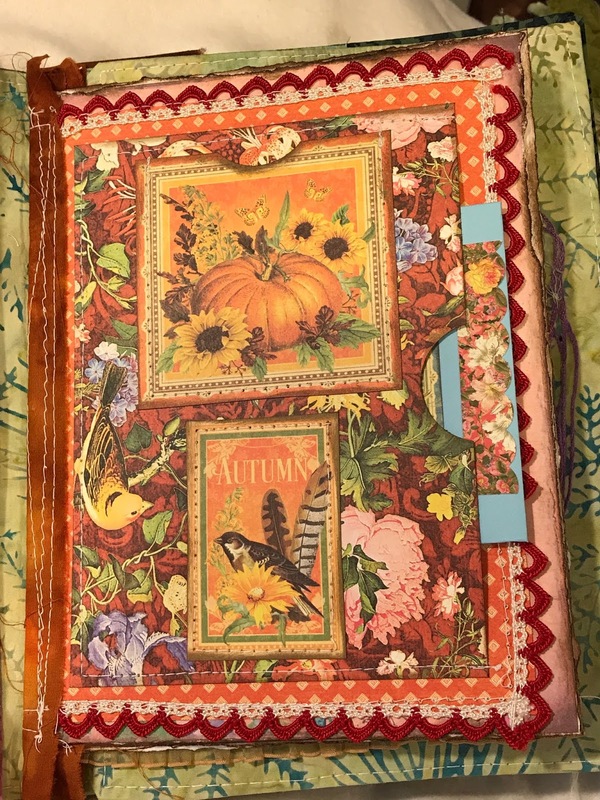 Each Seasonal Journal has 40 journaling pages printed on really lovely high-quality paper. 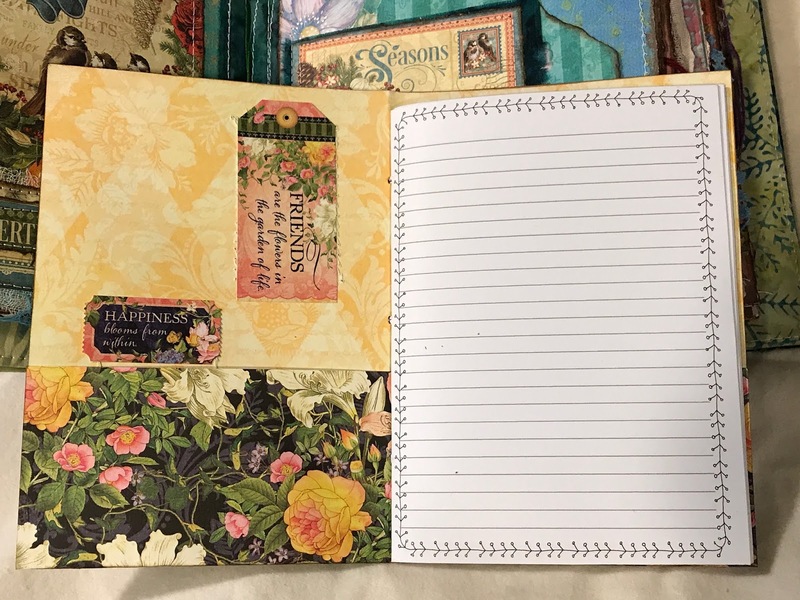 (Ink doesn't bleed through.) A few fun stickers, and pockets on both the inside covers. 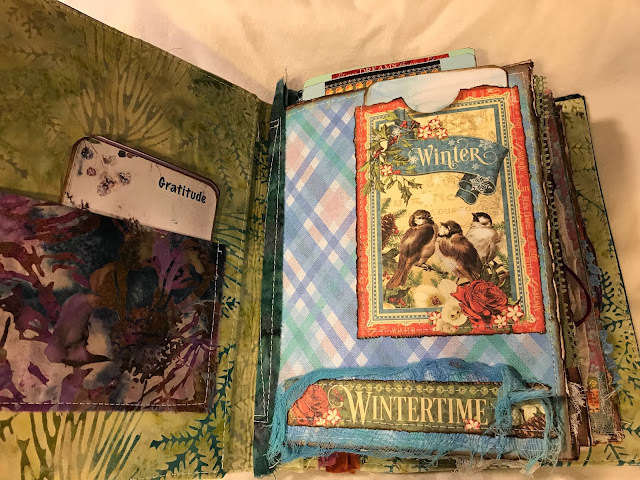 The next spread... a pocket on the right, completing the Winter Season. 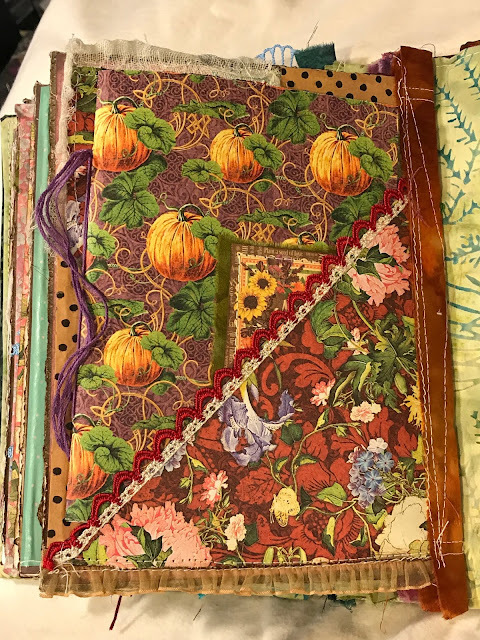 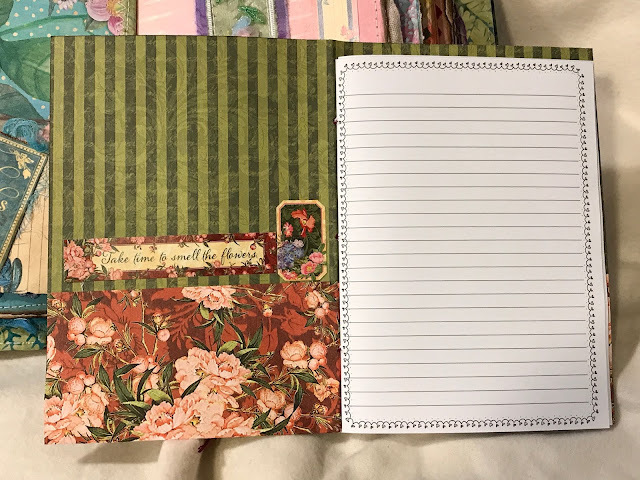 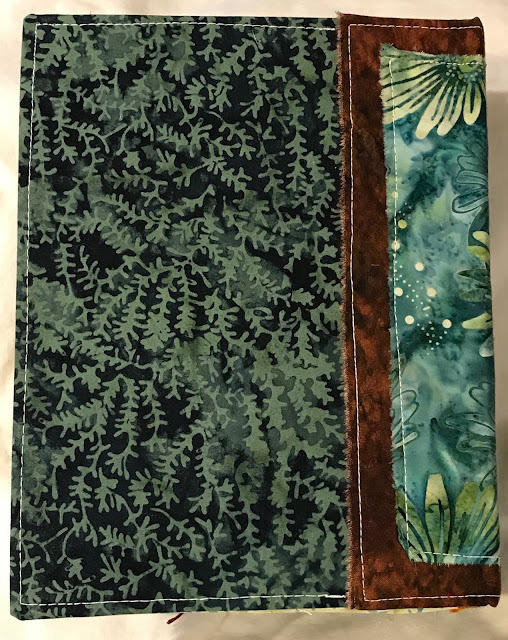 The right side is an extra page sewn in, opening to more journaling opportunities! The right side begins the Spring section. On the right is a 'belly band' holding the Spring Journal. 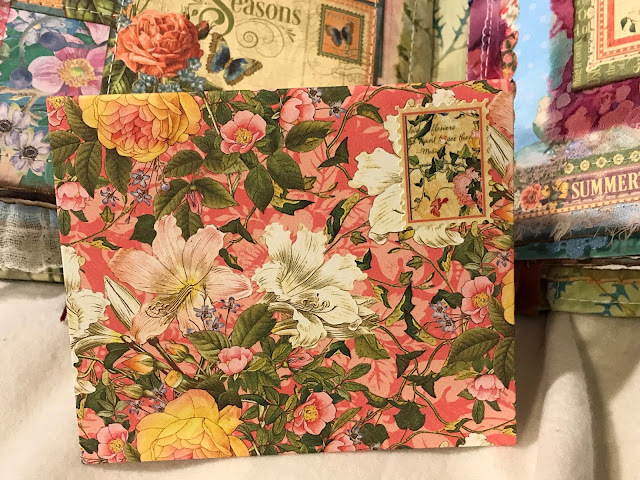 Center of the second signature...just pretty to look at. A deep side pocket on the right, and....More journaling tags on the right. Moving from Spring to Summer. 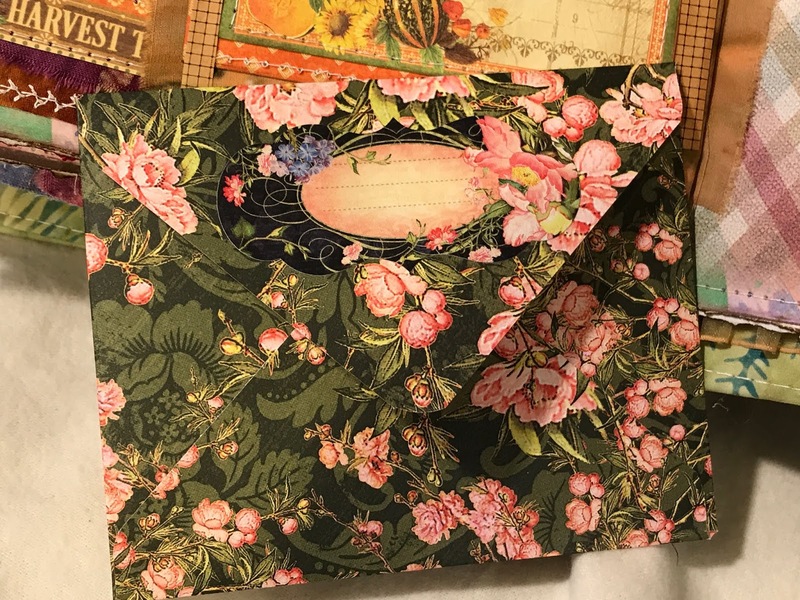 Two pockets on the right with an envelope and more journaling tags. 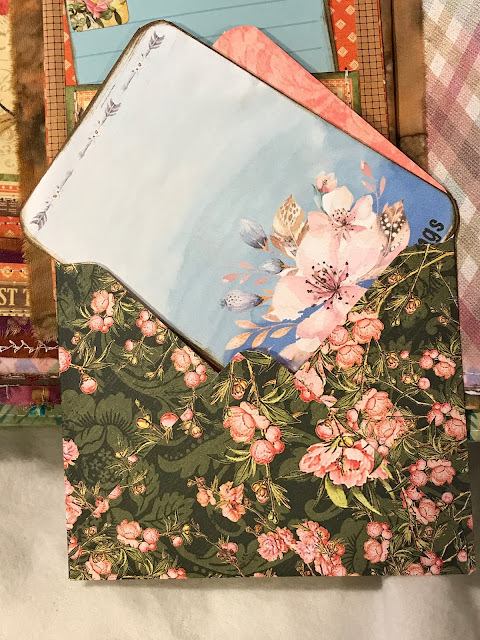 A sweet 4x5" envelope holding more journaling tags. 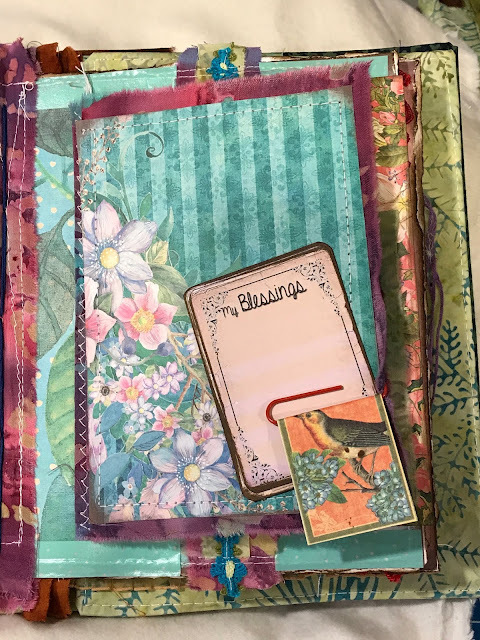 A half page pocket holds a removable large envelope with more journaling opportunities. 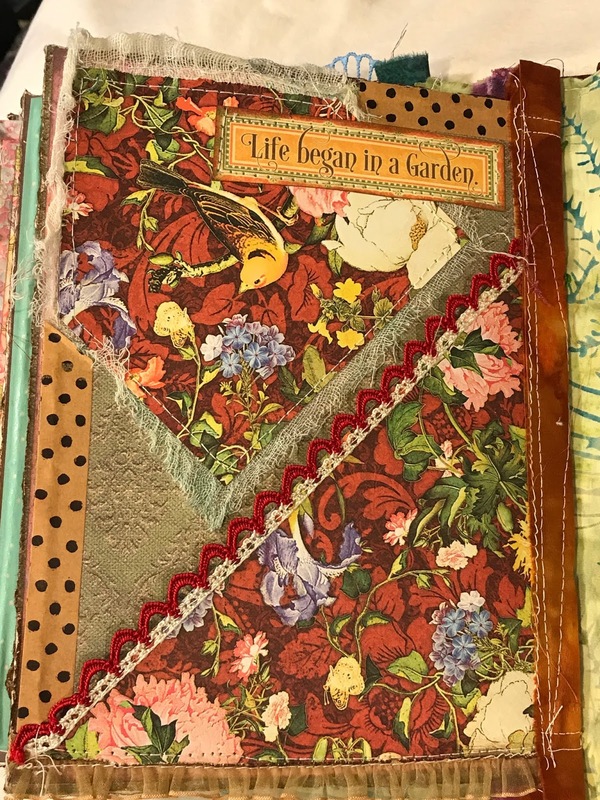 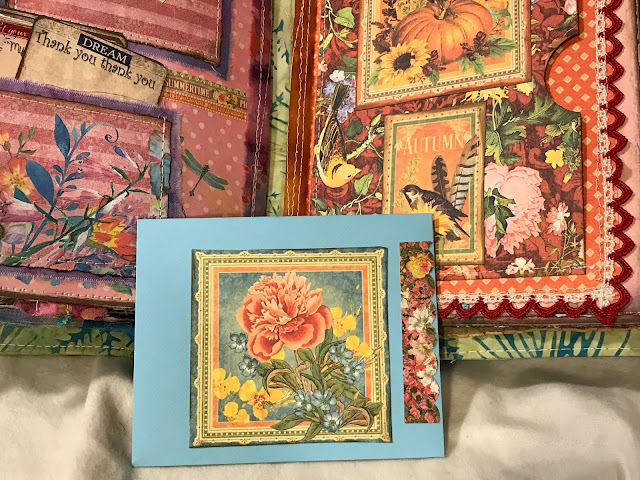 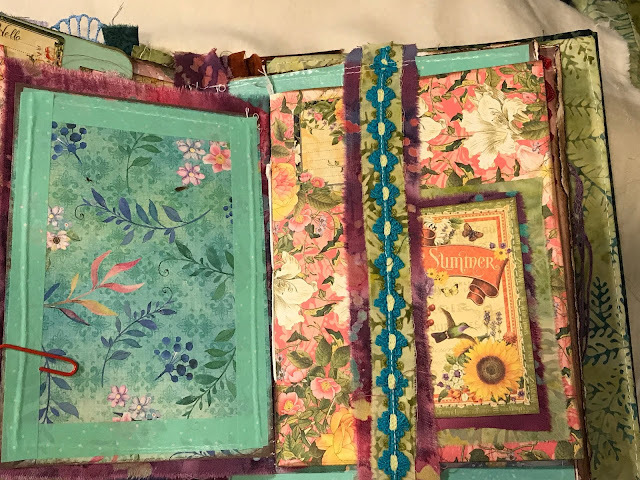 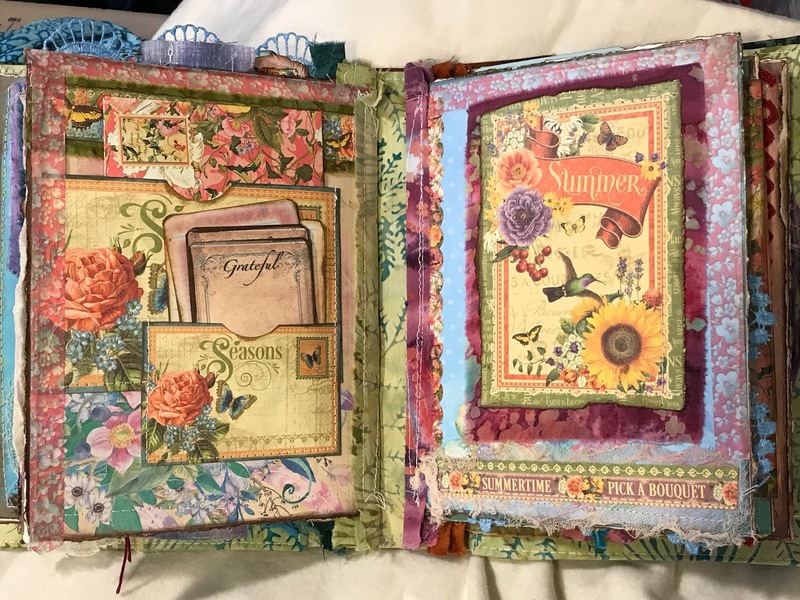 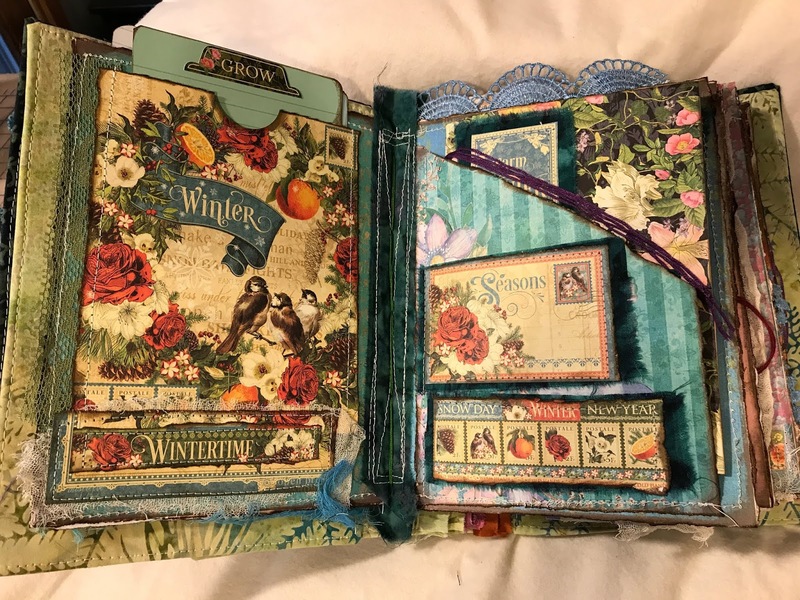 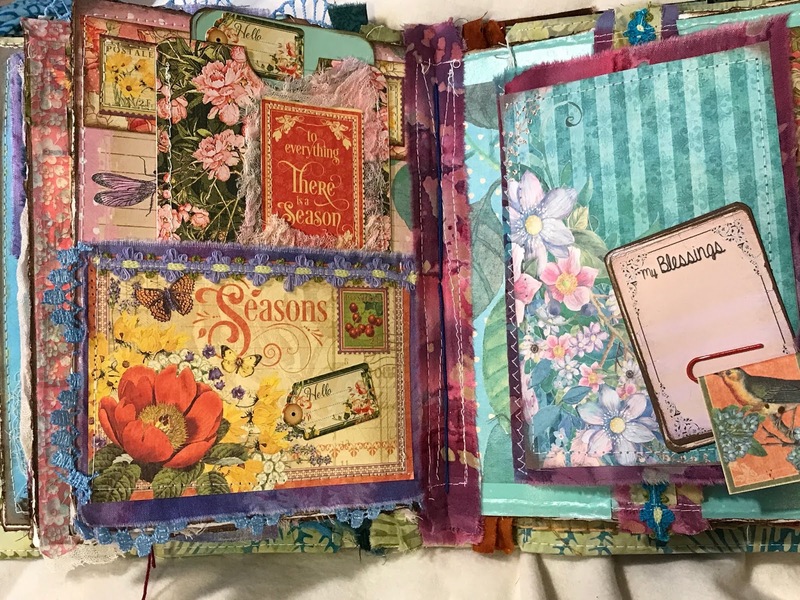 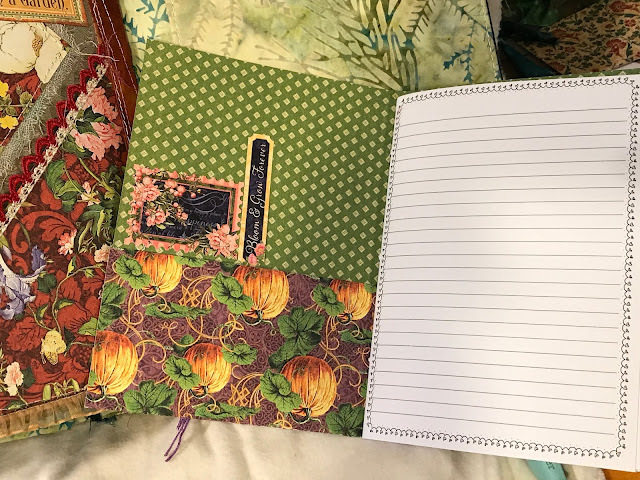 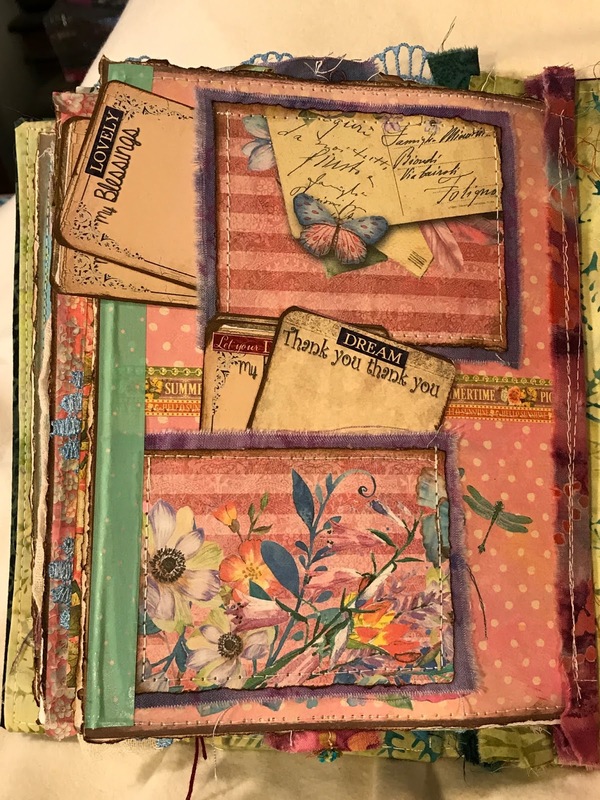 On the right side, a smaller page opens to another belly band holding the Summer journal. 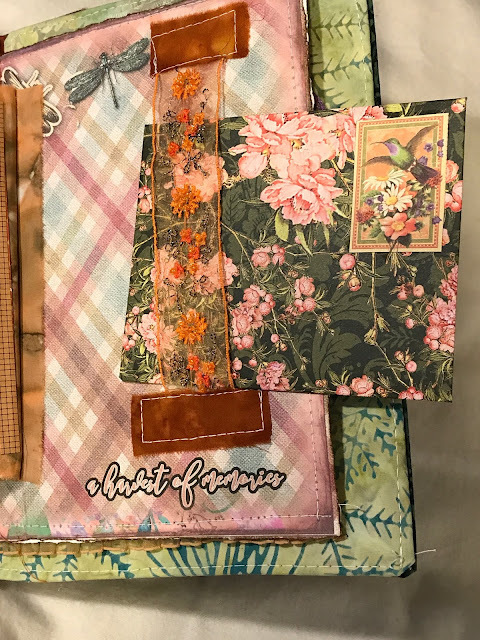 This next spread hosts two pockets on the right, completing Summer journaling tags and opportunities. 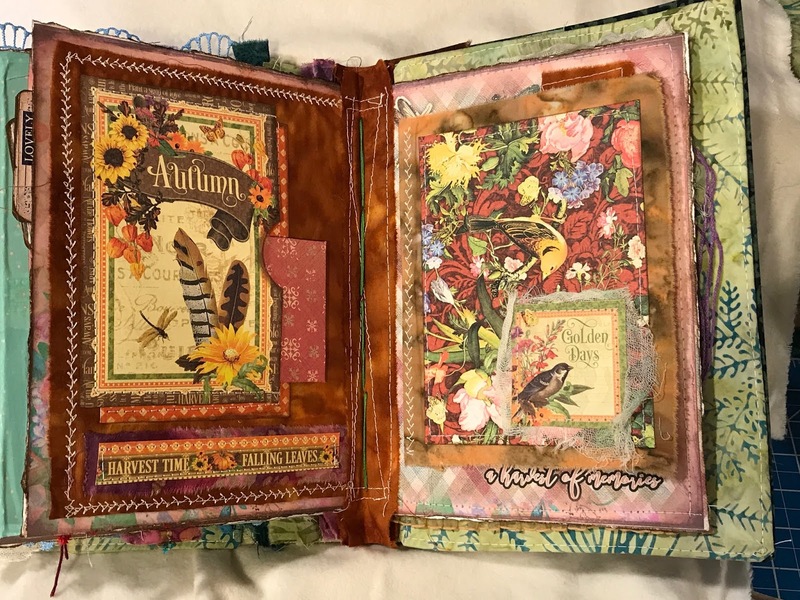 On the right, you can feel the chill in the air as Autumn begins. The Autumn side is framed with beautiful hand crochet trim. The color just seemed so perfect here. 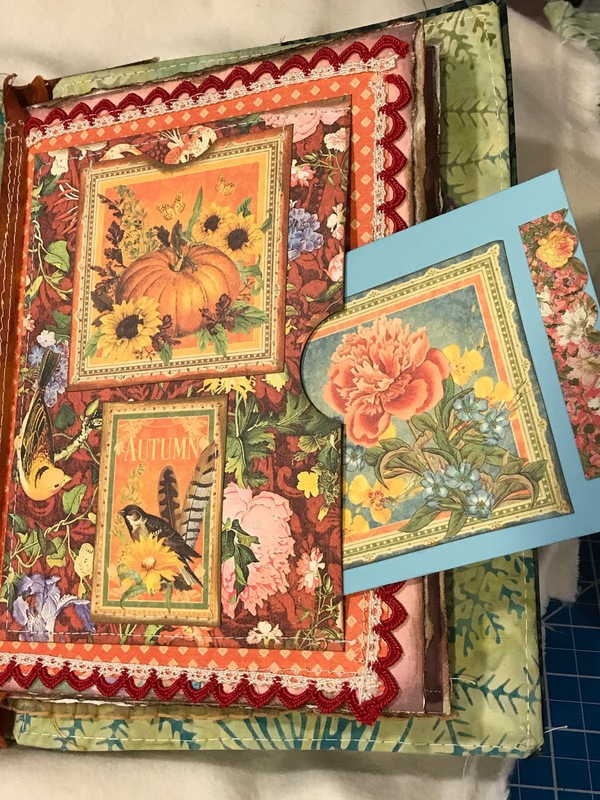 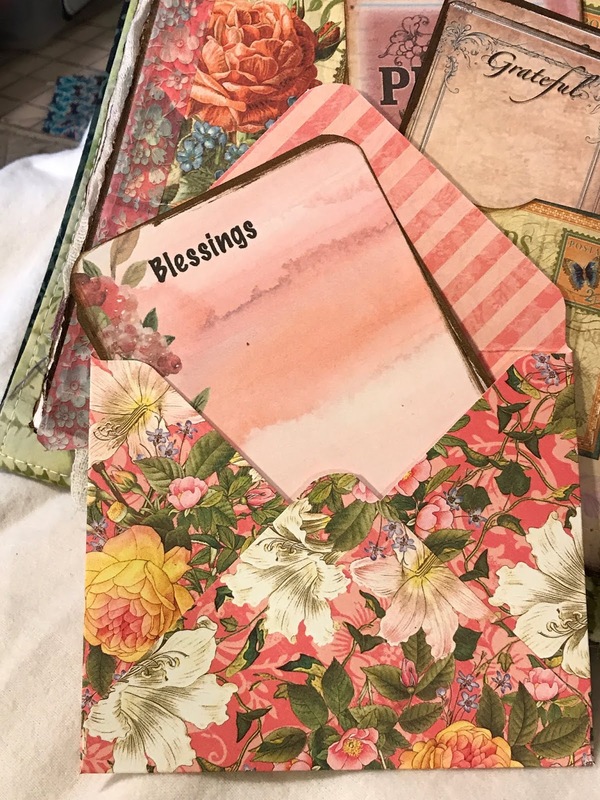 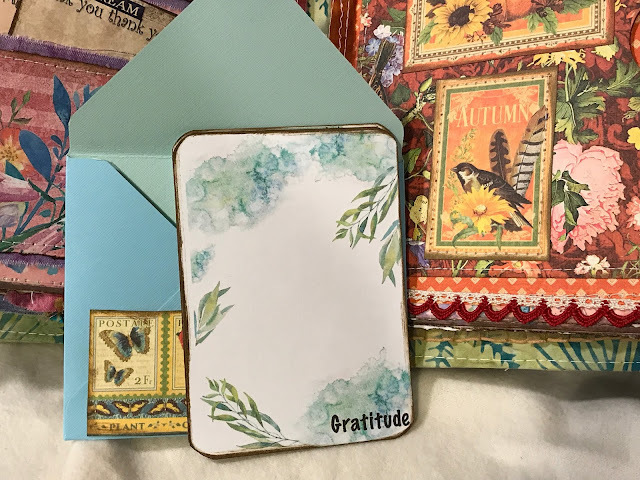 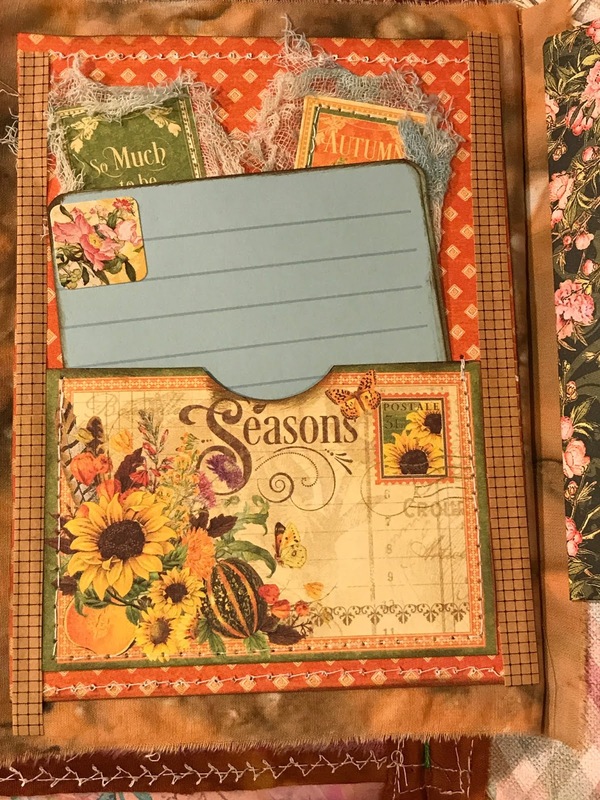 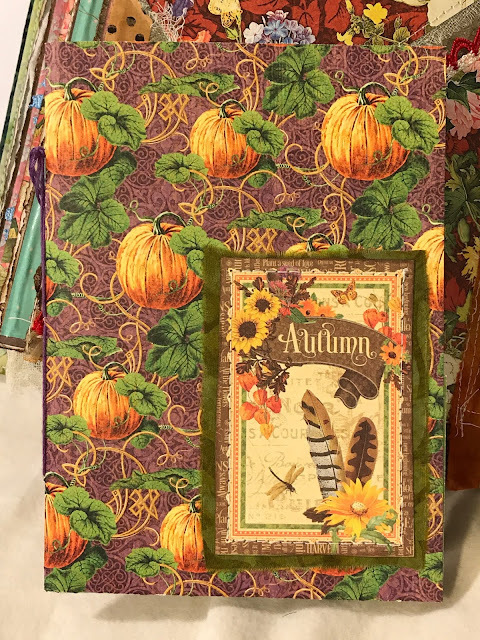 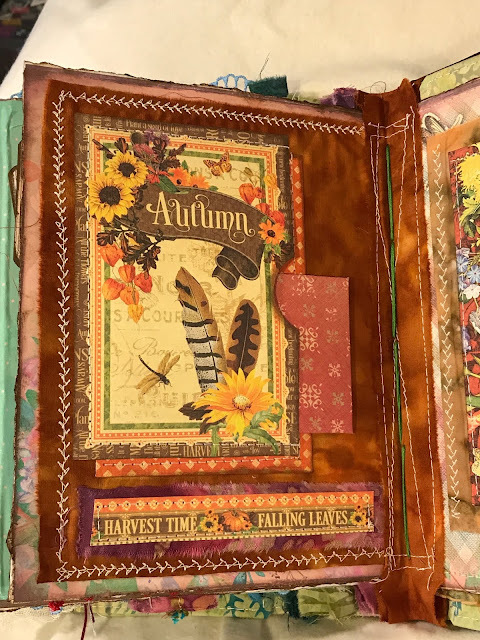 Autumn's center spread... pocket and small envelope on the left side with sweet 'blessings' cards to journal on. 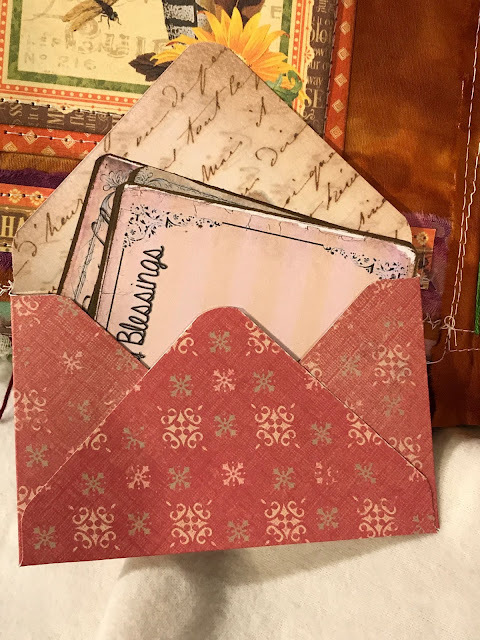 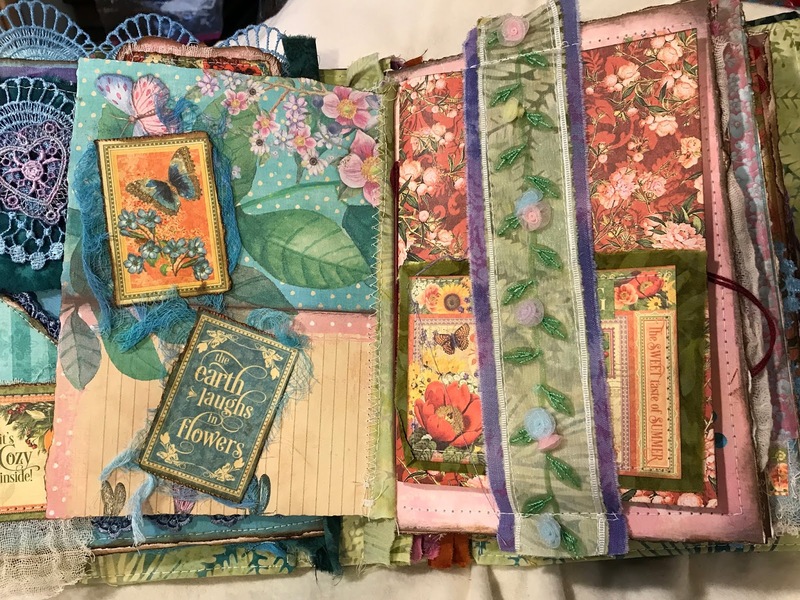 Opening to a small pocket on the left, with square journaling cards... and a ribbon belly band with an envelope tucked inside. Inside the last page... a triangular pocket houses the final, Autumn journal.